Join us for Scrap Camp Spring Fling 2019! Located at Pilgrim Firs Retreat Center in Port Orchard. All participants will receive their own space to scrap/craft in. Just bring your projects and get ready to have a great weekend of crafting. We welcome all kinds of crafts, bring your knitting, crochet, rock painting, sewing, quilting, painting etc. All Meals Friday Lunch to Sunday Lunch and Lodging are provided. Meals are served in the mess hall buffet style. There will be another group on the property and we will be sharing meals with them. Dietary restrictions are taken into consideration, please list restrictions when you register. Check in starts Friday at 10 am and Check out is Sunday at 2 pm. 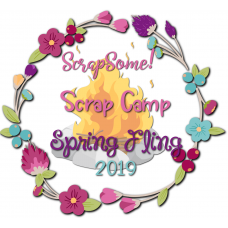 Scrap Camp Spring Fling Jamboree/early check in for Thursday the 16th evening/dessert party. More info to come. 24 hour room access, Make n Takes, optional projects (more information to come), games, raffles and a whole lot of fun! A small selection of new scrapping items will be available for your shopping pleasure. You can also place a personal order online, anything we carry in store or not (just contact me special orders are always welcome) and have your order waiting for you at check in. Bring your no longer needed items and put them up for new homes. Price is $200 per person based on shared room(2-4), $60 extra fee applies for single room occupancy. Deposits are $100, with full payment due no later than 05/01/2019. $50 late registration fee will apply to payments made after 05/01/2019. Under the "Options Tab" choose "Deposit" and check out. Under the "Options Tab" choose "In Full" and check out. ​Under the "Options Tab" choose "Deposit" and "Single Room" and check out. Will be on a first come first registered basis. All cabins are 1 floor, have electricity and running water. Each cabin has 2 sides, each side sleeps up to 4, and has its own bathroom. All beds are twin size. Single attendees who do not pay the “single fee” will be paired with other single attendees. All linens are provided. Feel free to bring your own pillows, blankets or towels. During Checkout- Step 4, "Add Comments About Your Order"
Please list your roommate(s) and if you have a floor preference, we will do the best we can to accommodate your preferences. Emails with more detailed information will go out closer to the event usually starting around 30 days prior. Please check for them!! There will also be a Cameo, Curio and Mint for use. Mint blanks will be available for purchase. Feel free to bring your own chair, if you have one. Or a chair cushion. An OTT light is suggested.- You may purchase one through the us for a discount prior to the event. Power will be available. Extra extension cords are recommended. Wi-Fi is available. But may be spotty and not adequate for streaming movies, videos or music. If you have food allergies or preferences, please email me asap, so I can get those to our Camp Hosts. Due to allergies of others, please do not bring or use diffusers, heavy perfumes or room sprays. Parking is tight, so we ask that you offload your items at one of the 2 doors and then move your car to a parking spot in "Elsewhere"
We will try to keep the temperature of the space comfortable for all. This may be cooler or warmer for some personal tastes. Please pack accordingly. Slippers, sweaters, pj pants, short or tanks if you run hot. No one will care what you're wearing. Please remember that we are at a camp, things will be rustic, and probably muddy :) pack your boots and a flashlight!